Hmmm juice, a nice refreshment option for this time of the year. I had to review the new flavours from Just Juice called "Just Juice Orchard" range that have come out. What I didn't realize is that they were 3 different flavours because of the packaging... I mustn't have been looking close enough but those litre packs are quite similar! I tried the Sun Kissed Orange with a friend of mine and we both weren't too keen on the taste. A bit tart but it did taste like fresh juice but not an overload of pulp. I wouldn't intentionally buy it. My sister and her family tried the Strawberry and Kiwifruit and really like the taste so that went down well! They said the Farm Style Apple tasted more like orange juice with apple. Rather then trying to sell it as an apple juice perhaps give it equal footing with orange. 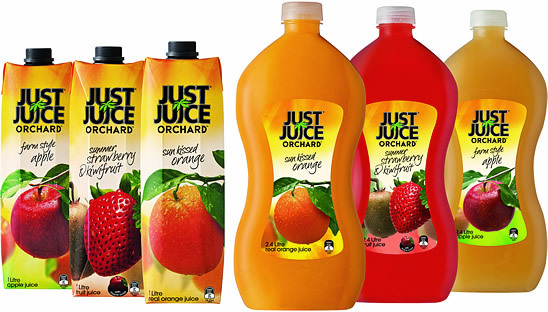 Anyway I like the Just Juice Range but these aren't for me. I LOVE the Strawberry/Kiwifruit one... it was a hit over christmas!